There’s no stronger bond than the love a mother has for her child. Morning, afternoon, and night, a mother and child’s day is filled with love. In this touching lullaby, a three-time Grammy nominee celebrates her newborn son. Lyrical and lovely, this soothing lullaby, accompanied by tender illustrations, is perfect for bedtime sharing. This package includes a hardcover book along with a CD of the lullaby being sung aloud. Jewel is an award-winning singer, songwriter, poet, and actress. She has four internationally bestselling albums and has been nominated for five Grammys. 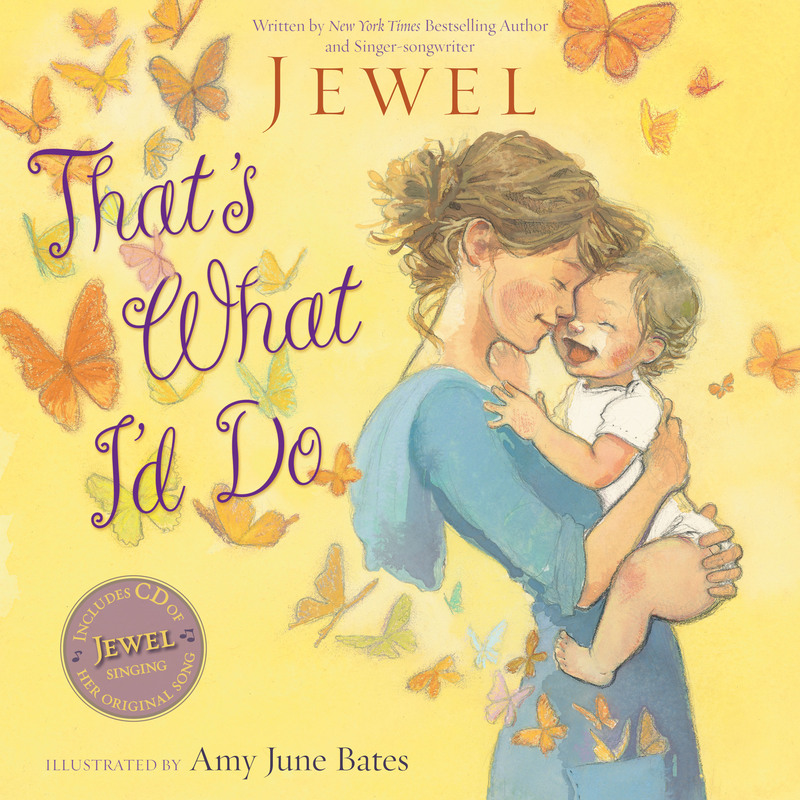 Jewel is the author of the New York Times bestselling A Night Without Armor and Chasing Down the Dawn, as well as the children’s books That’s What I’d Do and Sweet Dreams, both illustrated by Amy June Bates. She lives with her husband and son in rural Texas. The award-winning singer has taken one of her songs and created a gorgeous picture book to accompany her voice on the CD included. The rhyming text could also be read to children. This recording is taken from the lullaby CD, The Merry Goes ’Round. In the song, she proclaims what she would do if she owned the sky and had the power to remove the clouds, leaving only the blue. Or if she were a rabbit or a fish or a carpenter or the rain, she would profess her love for her child in equally compassionate gestures... children will love the richly hued artwork that perfectly complements each phrase. Using watercolors and pastels, Bates portrays human and animal mothers and their offspring in gentle, loving scenes. Because of the lofty quality of the lyrics, the youngest listeners could have difficulty recognizing some words on the CD but fans of Jewel and her music will adore the combination. A mother’s love song is presented with appealing, appropriate illustrations. Country singer Jewel composed and recorded a series of songs before her son Kase was born in July 2011. Most were released on the album The Merry Goes ’Round, but this one didn’t fit. Instead, it’s the basis for the new mother’s first children’s book. Bates has fancifully recreated song scenes using watercolor, gouache, pencil and pastels. A variety of objects—rabbits, goldfish, play house, rocking chair, hats and jewelry and the sun—appear in various iterations, inside and outdoors and, toward the end, together in baby's room. The mother paints the sun for baby's amusement, rocks him while giving him his bottle, and plays with him in a boat that looks much like a bathtub. They dance to bird song and admire themselves in a mirror. After a final rock in the chair, mother and baby end the story nose to nose. Butterflies flit through the pages, but the poem’s rhythm limps. Mothers who hope to share this tender sentiment with their own children would be wise to listen carefully to the accompanying CD. Rather than reading, it’s much easier to sing, “That's what I'd do, do, do, do, do. / ’Cause I love you, you, you, you, you..."